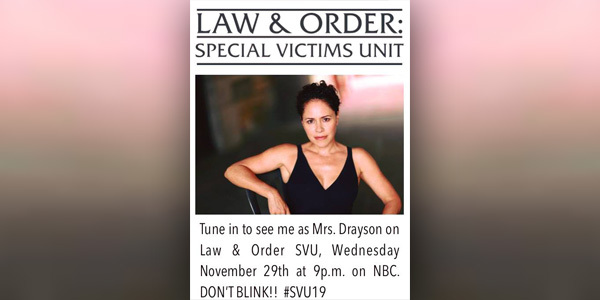 [Updated] Bermudian actress Lana Young is set to appear in an episode of the popular ‘Law & Order SVU’ television series this evening [Nov 29]. According to her official website, her “work includes the recurring roles of Mrs. Douglas in The Vampire Diaries [CW], Dr. Jacinta Butler in Greenleaf [OWN], Gloria Ruiz in The Inspectors [CBS]; Guest-star roles in Gone as Detective Michele Hodiak [NBC] and Linda in Kevin Can Wait, co-star roles in Jessica Jones, Blindspot, Satisfaction, Nashville, Law & Order, just to name a few. According to IMDB, Ms. Young’s other personal resume entries include roles in “Faux Paws”, “Plan 9″, “Danger. Zombies. Run.”, “Conservative Kink”, and “Killer Flood: The Day the Dam Broke”, along with voice acting credits in video games such as “FearFighter” and “Neverwinter Nights: Shadows of Undrentide”. When she’s not booking acting and voice roles in film, television, and other media, Ms. Young offers services to aspiring actors and actresses, including self-taping, coaching, and career consulting.